Black Mountain Trail Needs Your Help! The lower section of the Black Mountain trail – below its northern intersection with the Thrift Cove trail – will be closed for at least two weeks while the “Big Dig 2014” trail work project gets underway. 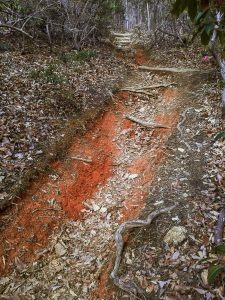 The project, which is being headed up by the Forest Service in conjunction with Pisgah Area SORBA, aims to revamp this popular, multi-use trail to make it more fun, more sustainable, and less susceptible to erosion than it currently is. 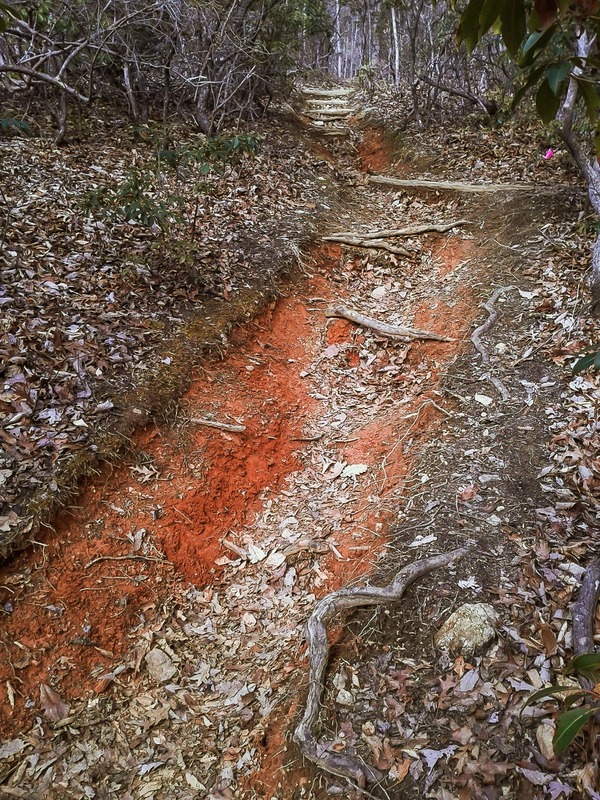 The trail – which, like many others in Pisgah, follows an old logging road bed – currently suffers from severe erosion in places. Previous efforts to stop the erosion using grade dips have largely failed due the trail’s heavy usage and steep gradient. This project will be an official road-to-trail conversion, which was never done on this corridor when the old road became a designated trail. The conversion process takes the alignment of the actively-used tread out of the ruts near the center of the road, and pushes it out toward the edges where water can more effectively be diverted off the trail. Segments of the trail will be rock-armored (especially near streams), and some new bridges will be built. The trail will wind across the road in places, making it twistier and reducing user speed, while also improving sight lines, which will serve to reduce the possibility of user conflict along this popular stretch of trail. Vegetation cut and soil moved during the project will be used to rehabilitate the eroded areas and keep sediment out of the streams which run nearby. The trail needs your help! The Forest Service is allowing anyone to volunteer on any of 10 public trail workdays to be held from May 29 – June 8. Volunteers are needed to help haul materials for rock armoring and bridge building, help do finish work after machines roll through, and help with final touches to ensure a timely re-opening of the trail. And if the conversion is successful over time, it will also serve as a model that can be used on other, less-than-sustainable trails in Pisgah – of which there are plenty, helping to ensure we keep these trails open to multiple uses as they are now. Please check out the schedule on Pisgah Area SORBA’s web site (listed below) and see if there’s a day you can come out. We hope to see you there! Eroded section of the upper Black Mountain trail. Not the section being worked on for this project, but illustrative of the problem along the entire trail nonetheless! Edit June 10, 2014: And it’s back! I had fun digging Sunday, even though there wasn’t much left to do, but I did get to see the finished product and even see some of the volunteers make first tracks. The trail has been officially reopened as of today and is ready for use! And here’s a great video showing the new dirt from a rider’s perspective – Pisgah Area SORBA president Chris Strout’s perspective, to be exact! Post by Pisgah Area SORBA.